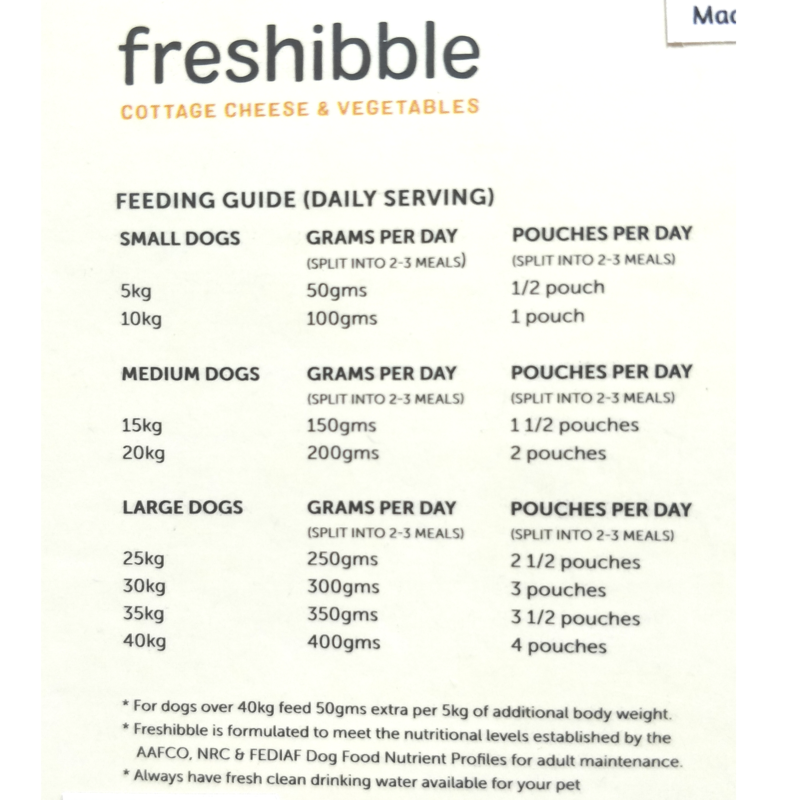 •	FRESH & NATURAL DIET FOR DOGGIES- Doggie Dabbas Freshibble is the easiest way to feed doggies fresh, whole and natural diet. •	PROTEIN RICH FOOD- This pack contains cottage cheese which is rich in protein and calcium that helps in building a strong immune system. 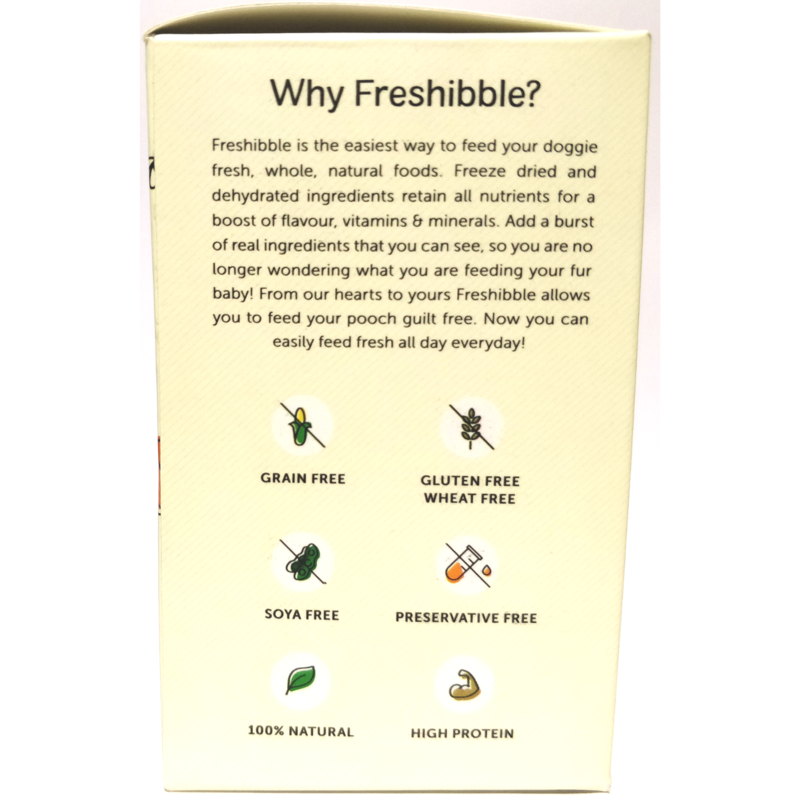 •	GOODNESS OF VEGETABLES & FRUITS- If your pooch hates veggies and fruits, then Freshibble is your saviour! It contains veggies like pumpkin, okra, beetroot and fruits like pomegranate, blueberries in a dried form. 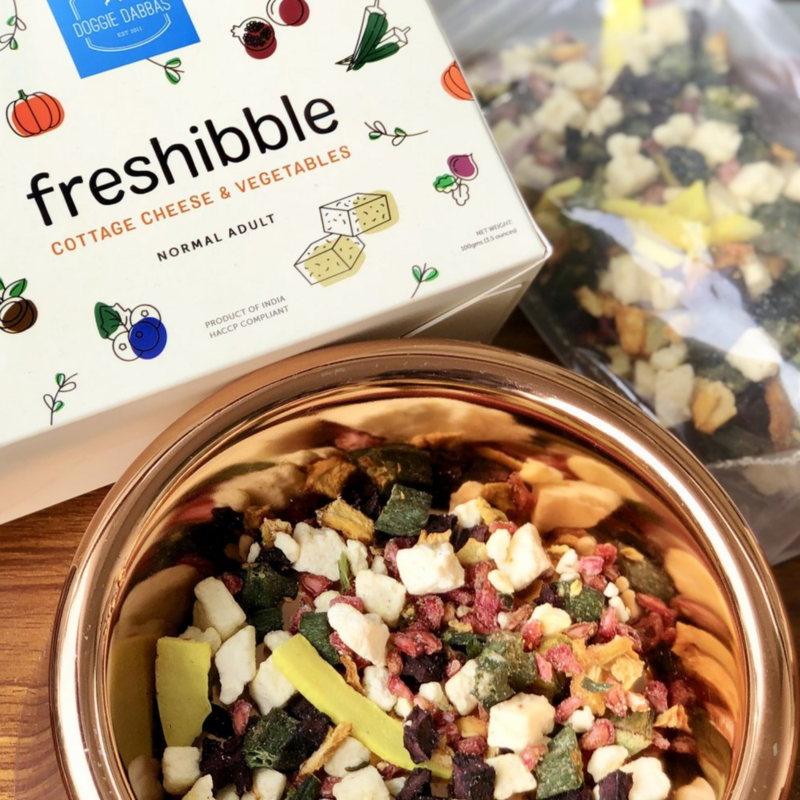 •	GLUTEN & WHEAT FREE- Freshibble is an assortment of freeze dried and dehydrated chicken, veggies and fruits which is free from gluten, grains and wheat. 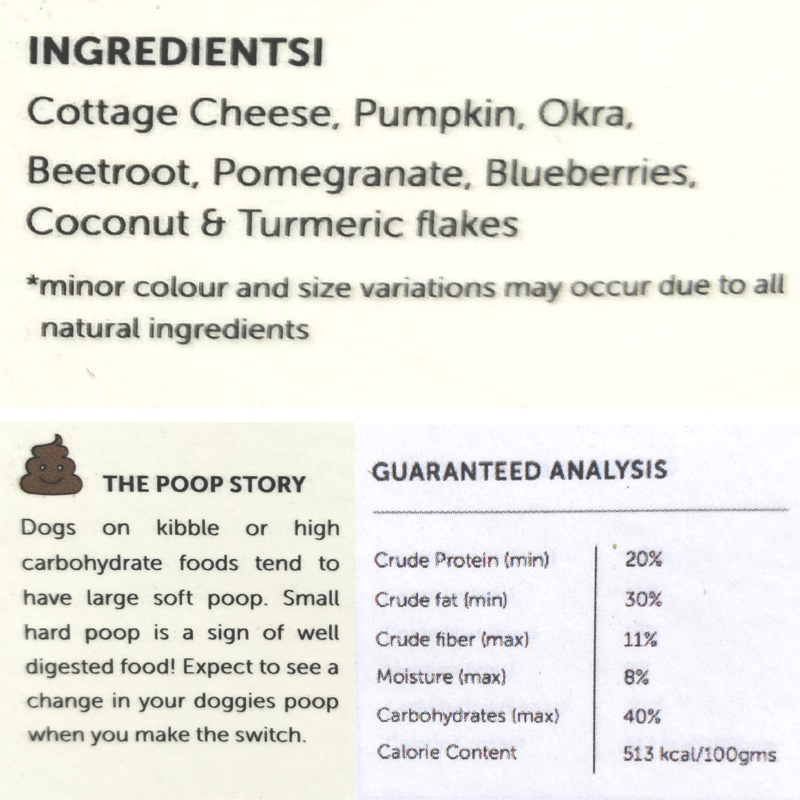 •	FEED DRY OR ADD WATER- This food can be fed both ways-dried & wet. 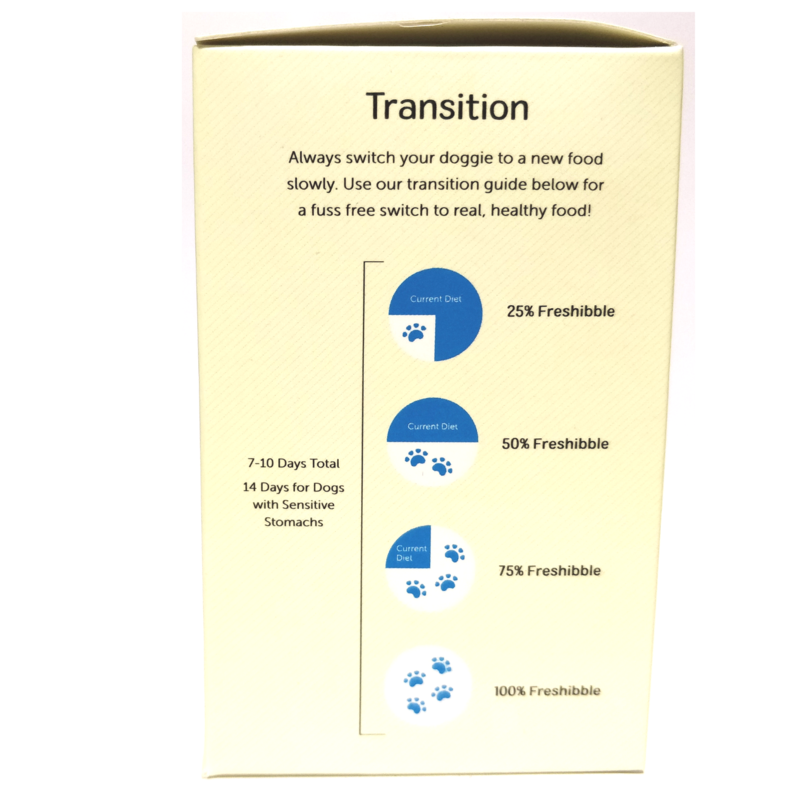 Just serve the dry Freshibble to your pooch or add water till content begins to float and rehydrate. 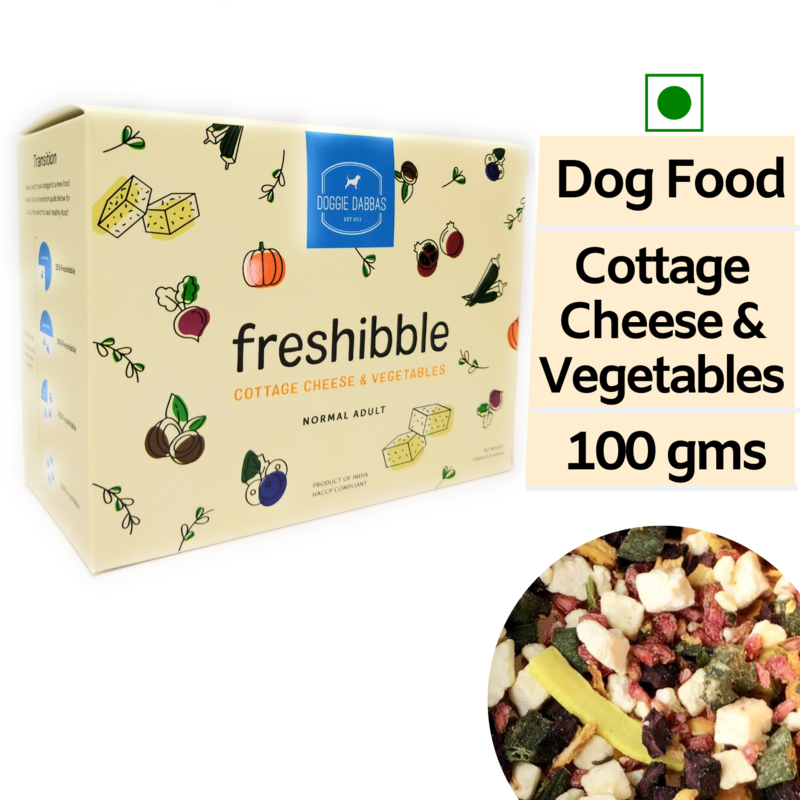 Doggie Dabbas Freshibble (Cottage Cheese & Vegetables) is a diet formulated to meet the nutritional levels established by AAFCO, NRC & FEDIAF. It is a diet crafted with all natural ingredients like cottage cheese, vegetables, and fruits in dried and dehydrated form. Cottage Cheese- This pack contains an apt amount of protein sourced from freshly made cottage cheese. Protein helps in keeping the immune system of dogs in good condition and also improves the energy level in them. Pumpkin- Pumpkin is an excellent source of soluble fiber and contains essential vitamins and minerals. It helps in treating a slew of ailments from digestive issues to eliminating intestinal worms to giving your pooch a shiny and healthy coat. Okra- Okra is a highly nutritious vegetable which is a good source of Vitamin B & C, Potassium, Calcium and other essential nutrients. It also helps in maintaining the blood sugar levels. Beetroot- Beetroot is a good source of fibre and other nutrients. It improves dog’s digestion and also helps in building strong immune system. Pomegranate- This fruit is high in medicinal value and helps in fighting skin related issues in dogs. Blueberries- Blueberries are natural anti-oxidants that helps in reducing free radical damages. Coconut & Turmeric Flakes- These ingredients contains various medicinal properties that helps in reducing inflammation, improves the health of immune system and also benefits the skin and coat in many ways.